This week, unexpected new results from NASA’s Hubble Space Telescope shows that the galaxies are accelerating 9% faster away from each other than previously anticipated, astronomers are not quite sure why! The international team of astronomers, led by Nobel Laureate Adam Riess, measured with unprecedented accuracy the movements of 2,400 Cepheid stars and 300 Type Ia supernovas in 19 galaxies, far beyond our Milky Way galaxies, and found that the rate of expansion of our universe (the so-called “Hubble constant”) is approximately 73.2 kilometers per second per megaparsec (1 megaparsec is equivalent to 3.26 million light-years.) with an uncertainty of 2.4%. This means that a galaxy 1,000,000 ly away from us is dashing away at regarding 22.4 kilometres per second, whereas another galaxy 2 million light-years distant is flying far from us doubly as quick, at 44.8 kilometres per second, explained cosmosmagazin. This rate of expansion is in conflict with studies of radiation left over from Big Bang — some unknown forces are speeding up the expansion of the universe for reasons scientists can’t explain. At this rate, these mysterious forces will make the distances between the objects to double in 9.8 billion years. 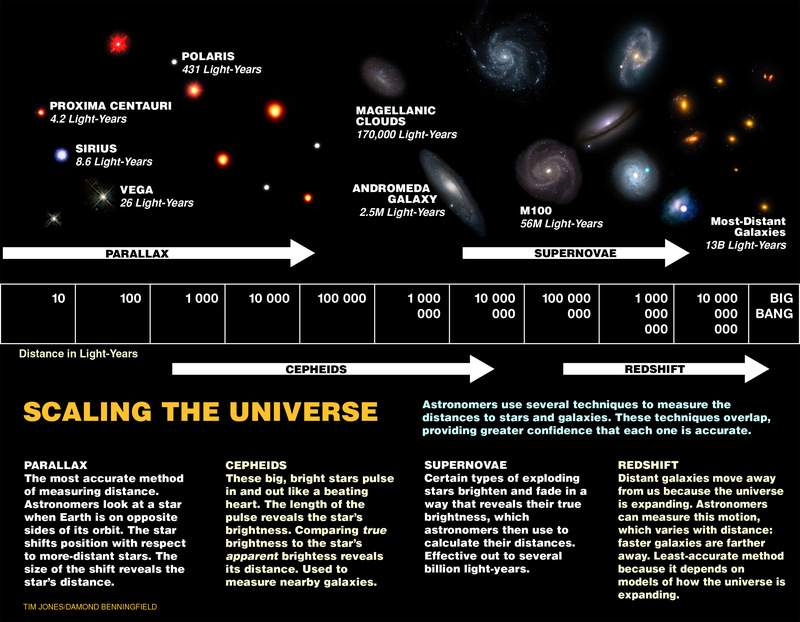 Its unclear why the universe is expanding so fast but there are some hypotheses. One possible explanation could be the mysterious force known as dark energy, a weird anti-gravity force discovered in 1998 which is hypothesized to contribute 68.3% of the total energy in the present-day observable universe. Dark energy may be much stronger than scientists had thought and thus pushing galaxies apart from one another more powerfully than originally estimated. Another explanation for the discrepancy is that dark radiation — subatomic particles, similar to neutrinos, that travel nearly as fast as the speed of light — could be playing a role that hasn’t been taken into account, astronomers said. Dark radiation, ideally different from dark matter & dark energy, may have changed the balance of energy in the early history of the universe 13.8 billion years ago, more energy from dark radiation boosted the acceleration to today’s expansion rate. And finally, Einstein’s theory of gravity isn’t quite right when we look at the whole universe, which is really troubling. astronomer Dr. Brad Tucker told the ABC. This new result is actually important for many reasons, an expansion universe can give us interesting scenarios for the future of the universe and its ends. The universe could end in what is known as the Big Rip: the matter of the universe, everything we know and everything else besides, is progressively torn apart at a certain time in the future, vanishing from view, 22 billion years from now. Alternately, the expansion of the universe will continue forever and thus its turn into a cold universe with no stars and completely empty, this is known as the Big freeze or the Heat Death. astrophysicist Steve Allen of Stanford University said. But if the expansion is going to get faster and faster, eventually those galaxies will get pulled too far away for us to see. Space becomes an ever- less beautiful and rich place. The universe becomes a relatively lonely place. The truth is that it’s still an open scenario, we certainly don’t know for sure what’s going to happen. So, in short, there’s a lot of work left to do before astronomers can fully appreciate the meaning of the new results. study co-author Lucas Macri, of Texas A&M University, said in the same statement. More research is needed to verify the cause behind these accelerating rate because something is not right, scientists added. The research will be published in upcoming edition of the Astrophysical Journal. Sorry nope, I’m not buying a bit of it. Whatever is making the light seem to indicate this is being misinterpreted in a big way. Nope, I just don’t buy it. There’s clearly something we just don’t yet know about the behavior and degradation of light over time and distance as well as passing through the intergalactic medium. I say that based exclusively on the idea that the Universe flying apart at an ever increasing speed just doesn’t pass the smell test. If the Cosmos is infinite in both time and space, then wouldn’t the remnants of an infinite number of other Universes that have previously flown apart be traveling in all directions through ours resulting in a completely chaotic mess? Nope, I’m not buying this, the conclusion is just too bizarre and unrealistic.